As much as we hate doing laundry, most of us can’t imagine life without a washing machine. But have you ever noticed that gunk that builds up around the washing machine door jam? What about the grains of dirt and sand that accumulate inside of the machine’s drum? When you have dirt and grime inside of your washing machine, this can impact your machine’s performance and the cleanliness of your clothes. It’s time you washed your washer. To avoid damaging your washer or your clothing, you need to maintain and care for your machine properly — and that’s true whether it’s a front-load or top-load machine, is brand new and beautiful or the reliable one you’ve had for years. We’ve put together some tips on how to correctly clean your washing machine, as well as some washer-cleaning methods to avoid. Here are the right (and wrong) ways to clean your washing machine. Is it time for an upgrade? You can also check out our guide to the best washing machines. Step 1: Leave the door open after you remove your clothes, and allow your washer to dry out completely when you’re not using it. This helps prevent mold and mildew from growing in your washing machine. Step 2: Use a damp cloth and a small amount of liquid anti-bacterial soap to wipe the inside of your machine. Step 3: Wipe up any dirt, spills, and grime from your machine’s exterior and from the door jam with a damp cloth and mild soap. Maintenance tips: Change the fill hoses on your machine every five years, per the recommendation of GE Appliances. It’s a good idea to label your fill hoses, indicating the date you replaced them. Just label some masking tap with a Sharpie. We also asked GE for suggestions on how to clean top-load washing machines properly. They suggested we use Tide Washing Machine Cleaner once a month to clean and freshen the unit, and to refer to the washing machine’s owner’s manual for additional cleaning and maintenance instructions. What not to do: It’s best to avoid using harsh cleaners, notably those that contain ammonia. You should also shy away from anything that’s too abrasive, like gritty cleaners or scour pads. Harsh cleaners can damage your machine. Those who prefer a particularly light touch can use vinegar, although this sometimes create odor problems, so use it sparingly. Step 1: Leave the door ajar after you remove your clothes with a front-load washer as well, and allow it to dry out completely when you’re not using it. This helps prevent mold and mildew from growing. Step 2: Clean the washer door by wiping it down with a damp cloth. You can use a small amount of vinegar or heavily diluted bleach (we’re talking one part bleach to ten parts water) to help remove any built-up gunk. Step 3: Clean the door seal. Gently pull back the seal between the door opening and the drum, and check for foreign objects; remove any you find. After that, check for stains or dirt buildup. Note that many rubber washer seals have both inner and outer layers: Clean and inspect them both, since hair, grime, and objects can get stuck in many places. You can clean dirt buildup using either washing machine cleaning wipes, or a solution made of bleach and water (¾ cup of bleach mixed with one-gallon of water). Make sure you remove any leftover bleach solution with a damp cloth. Finally, allow the washer to air dry completely with the door open for at least an hour or two. Step 4: Clean and sanitize your detergent tray. Take the tray apart (if applicable) and soak it in hot water and mild soap for about 20 minutes. Step 5: Clean the inside of the washing machine. For example, most high efficiency (HE) washers have either a “clean cycle” or a “clean with Affresh cycle.” To run a clean cycle, add ¼ cup of bleach to the bleach dispenser and run an empty load. To clean with Affresh, add an Affresh cleaning tab directly inside of the washer drum, and run an empty “clean with Affresh cycle.” If you don’t like Affresh, don’t worry: There are plenty of other washer cleaning options out there, including Tide Washing Machine Cleaning Pouches. Maintenance tips: It’s best to use HE detergent when you have an HE washer and to avoid using too much detergent, as this can cause excess buildup. Lastly, use warm and hot water washes periodically (but not all of the time), as warmer water can help control soil and detergent buildup, per the recommendation of Maytag. Remember, even a simple wipe-down after each load can help keep your laundry clean. What not to do: Some HE washer owners run a clean cycle only and neglect the other steps. You should try to clean your HE washing machine every 30 wash cycles, and follow all of the steps to make sure you are not allowing dirt and grime to accumulate in other parts of your machine. It’s easy to wipe your machine down with wipes, and it’ll keep your clothes cleaner and your machine running better. Step 1: Clean the control panel with a damp cloth. Step 2: Does the water hose on your washing machine have a filter? If so, remember to clean it out once or twice a year. To do so, soak the filter in water until it is clean (make sure the threaded connector is also submerged). Then allow the filter to dry completely in a shaded area. Step 3: Clean the dispensers. Rinse the inserts in warm water to remove traces of accumulated detergent and other laundry products. Then clean the recess with a toothbrush to remove residue. Finally, give the interior a wipe down with a damp cloth to remove any larger deposits. Step 4: Now, run the self-clean cycle. 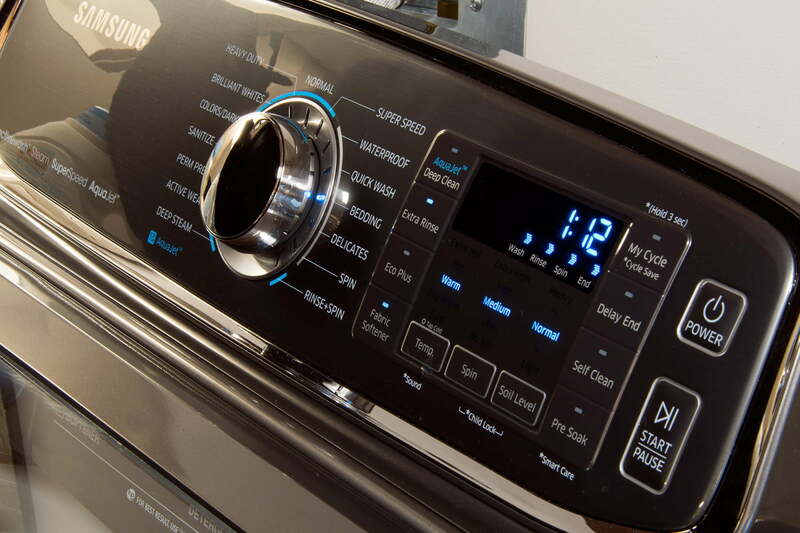 Some self-clean cycles, such as those on Samsung washers, may give you an indicator light that turns on when the washing machine senses it needs to be cleaned. You can usually turn the self-clean cycle on whenever you want. Make sure you read your instruction manual carefully to find out exactly how you’re supposed to use the clean mode. Self-clean cycles are typically designed to work without a cleaning agent, so don’t add anything to the washer before you begin. Maintenance tips: Clean the outside of stainless steel machines using stainless steel cleaner, vinegar, or Windex. When you clean stainless steel, it’s best to go with the grain. You can also use a little bit of rubbing alcohol to dissolve oily finger prints, per Better Homes and Gardens. Also, if you have a shiny metallic finish on your washer’s exterior door, you can clean that surface using a small amount of Cerama Bryte and a clean, damp, non-abrasive cloth, per the recommendation of Samsung. What not to do: Do not use harsh or abrasive cleaners when cleaning the control panel, and avoid using bleach cleaners on stainless steel surfaces. Also, do not run self-clean cycles while you have laundry in your machine.